Aktiv Brands Dominates with Double Opening! The Aktiv Brands Group have celebrated the opening of not one, but two stores in the recently redeveloped Mandurah Forum Shopping Centre last month. Both brands in the group’s portfolio, Bucking Bull and Skewerz Kebab opened in the centre’s food court, side by side, taking the total number of Aktiv Brands outlets to 40. Both Bucking Bull and Skewerz operate under the same best practice model, however they appeal to very different segments in the market. “Bucking Bull is a boutique carvery offering specializing in slow cooked and roast meats, whilst Skewerz Kebabz is a modern kebab outlet inspired by the flavours of the Mediterranean,” Dean said. “Our new indoor-outdoor food court has provided the region with an exciting new destination for dining, entertainment and relaxation and we’re thrilled to provide these two excellent quality dining options to our customers,” Ms McKenzie said. “Last year we launched the very first licensed Bucking Bull at Watertown Brand Outlet Centre in West Perth, and a sit-down, casual dining model for Skewerz Kebabz is currently in development,” Dean said. 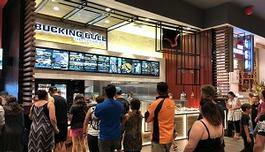 Bucking Bull and Skewerz Kebabz opened on 22nd March, 2018 and are located in the food court at Mandurah Forum, 330 Pinjarra Rd, Mandurah WA 6210. Aktiv Brands now has 40 outlets located across Perth, Brisbane, Townsville, Melbourne and regional NSW.